Emodepside is an antiparasitic active ingredient used in veterinary medicine in dogs and cats against internal parasites (mainly roundworms). It is not used against agricultural and household pests. It belongs to the chemical class of the depsipeptides. The table below indicates some usual dosing recommendations for emodepside issued by manufacturers or documented in the scientific literature. They may not be approved in some countries. Emodepside is a broad-spectrum nematicide used moderately in pets for the control of roundworms, either for oral administration (tablets) to dogs, or for topical administration (spot-on) to cats. It is not used in livestock or horses. Emodepside has no efficacy whatsoever against tapeworms, flukes or any external parasites. It is mostly used in combination with praziquantel to ensure simultaneous tapeworm control. WARNING: Dogs of some breeds do not tolerate emodepside or macrocyclic lactones (e.g. ivermectin, milbemycin oxime, moxidectin, selamectin, etc.) that can cross the blood-brain barrier. They can suffer more or less serious adverse effects if treated at dose rates slightly higher than the recommended ones. Consequently dosing must be as accurate as possible. This is the case for Collies and related breeds, which have a mutation in the MDR-1 gene that affects the blood-brain barrier and makes it more permeable to such compounds than in dogs without this mutation. Besides Collies, other dog breeds have shown similar problems, although the MDR-1 mutation has not been confirmed in all of them. The breeds more affected by this mutation are (% frequency): Collie (70%), Long-haired Whippet (65%), Australian Shepherd (50%, also mini), McNab (30%), Silken Windhound (30%), English Shepherd (15%), Shetland Sheepdog (15%), English Shepherd (15%), German Shepherd (10%), Herding Breed Cross (10%). Other less affected breeds are: Old English Sheepdog, Border Collie, Berger Blanc Suisse, Bobtail, Wäller. The only way to be sure that a dog is affected or not is to test for it. As more dogs are tested it is likely that the mutation is discovered in other breeds, or that the frequencies change. Learn more about emodepside safety. Emodepside is a semi-synthetic derivative of fermentation products from Mycelia sterilia, a fungus that grows on leaves of Camellia japonica, the Japanese camellia. Emodepside is used in dogs (as tablets) and cats (as a spot-on), so far always in combination with praziquantel, a specific taenicide. Emodepside is not used in livestock so far. 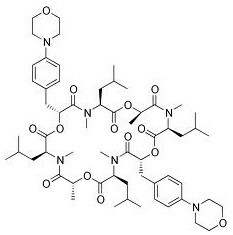 Emodepside is a medium-spectrum nematicide, highly effective against several gastrointestinal worms of pets (e.g. Ancylostoma spp, Angiostrongylus vasorum, Crenosoma vulpis, Toxascaris leonina, Toxocara canis, Toxocara cati, Trichuris vulpis, Uncinaria stenocephala). It also inhibits egg production of the worms. Emodepside is not effective against non-gastrointestinal roundworms, tapeworms (cestodes) or flukes (trematodes). Excretion is slow: halftime after topical administration to cats is ~9 days. In rats, about 45-55% of the administered dose is excreted unchanged, mainly through feces, the rest in the form of numerous metabolites.